One is a painting and interior decorating company called No Drip Painting; the other is managing several websites. Running my own business offers some great perks, including having more control over my time and where I work, but it comes with its fair share of headaches and worries. Plan for taxes. Being a small business owner means taxes aren’t automatically taken out of your pay check. This was one of the biggest adjustments I had to make. If you don’t set money aside to pay your taxes, you’re going to be hit with a fat tax bill and possibly penalties at the end of the year. I have found an online savings account to be a great way to save for my taxes. I simply estimate how much I need to save each month and then transfer that amount to a land far, far away. 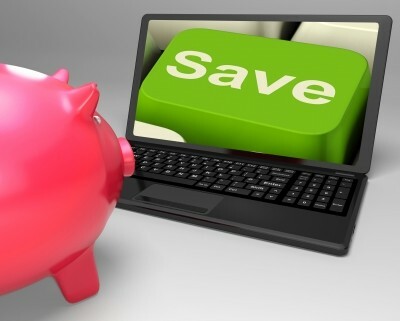 I choose to use an online savings account because I can’t access the money as easily as if it were at a local bank. This keeps me on track and ensures the money is there when it’s time to make my quarterly estimated tax payments to Uncle Sam. Have multiple sources of income. When I started my painting business, I still had steady income from my blogging job—and I wouldn’t have been able to start my second business without it. I needed a guaranteed income that was large enough to cover my regular expenses. This meant my business was going to have to start out as a “side” business so I could still make somewhat of a regular income. I also knew I was going to have some added expenses to get things up and running, so I got creative and found some non-traditional ways to make extra money. I sold some furniture on Craig’s List and even cleaned houses. This extra dough was a huge help with some of the start-up expenses for the business. Pay down your bills. Paying down some of your bills will alleviate a good deal of stress while you are getting your business up and running. Start by paying down your high interest rate bills first, like credit cards. Eliminating this type of debt will save you money in the long run and will improve your credit score, which will help when it’s time to establish credit for your business. Plan for health insurance. One extremely important facet of being self-employed is that you are responsible for your own health insurance. This is one thing you should not overlook because paying for your own health insurance can be expensive. With my business, if I’m not healthy I’m not making money, plus there’s always the chance of getting injured while on the job. Unfortunately, many people are forced to file bankruptcy due to their unpaid medical bills, which can totally wreck your finances. Shop around for individual health insurance plans to ensure you can qualify and to get an idea of the cost. Insurance for your business. There will be a number of expenses you encounter with your business, one of which is insurance. Be sure to research this ahead of time to determine what type of insurance you need and just how much coverage to get. This is something I wasn’t well-prepared for and as a result paid for more insurance than I actually needed. As with any insurance, you should shop around and compare rates. Also, check to see if you are eligible for any discounts. Final thoughts. Becoming a business owner is an exciting and empowering path to travel, but it can also be a huge strain on your finances if you don’t have a solid plan. Be sure your plan includes some of the points listed above and you will save yourself some money.